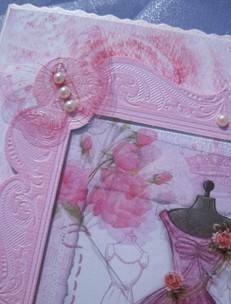 A wonderful 'girly' birthday card with a background of pink roses and script on a pearlescent pink deckle-edged 126 x 178mm (5" x7") card. An image of a pink prom dress on a mannequin is overlaid with an acetate dome which stands away from the image, to give a 3D appearance with roses, heart, sewing etc, all in a raised pink frame embellished with seed pearls and a see-through butterfly. 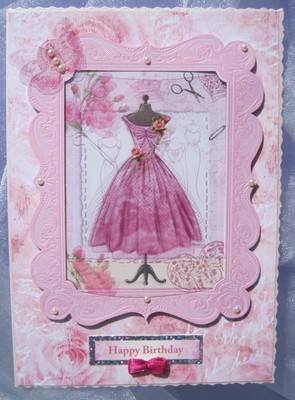 The banner 'Happy Birthday' is bordered in silver and is finished with a fuschia pink bow. The paper insert reads 'Wishing You a very Happy Birthday' or choose an alternative below.